In yesterday's "What You Need To Know Today" I posted PressPausePlay's interview with Seth Godin. In this short video, Seth talks about how he managed to turn a free book into one of his best sellers of all time. So, could you do this today? 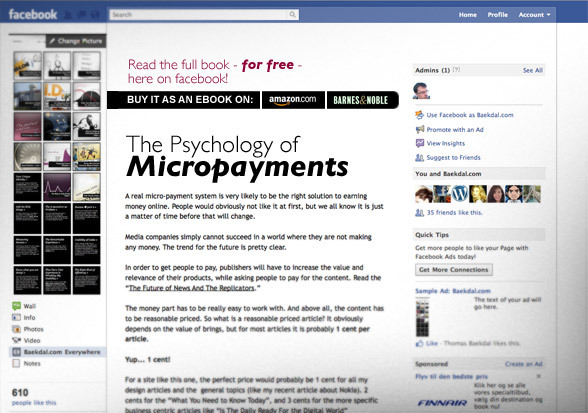 Could you give people a free ebook, and then earn huge amounts of money selling a print version? The obvious answer is, "no you can't." At least not in the same way. The era of giving something away for free on the internet is over. That worked back when the internet was hugely popular, but not really useful. I was one of the many people who downloaded the free ebook only to end up buying the physical printed one (I actually bought three). The ebook was very interesting. It came in the form of a PDF in the usual portrait format, which you had to read at your desk on a 14" laptop... I mean, come on. That just didn't work. It was a brilliant marketing move to publish the book this way. It created a huge amount of buzz. It gave people a choice, but it wasn't actually useful. You had to get the printed book if you really wanted to read it. Fast forward to 2011, and the world has changed. As Amazon announced in January "For every 100 paperback books Amazon has sold, the Company has sold 115 Kindle books; and the company has sold three times as many Kindle books as hardcover books." A free ebook today won't get people to buy the printed book. We will just take the ebook, put it on our iPads, and slump down into the couch for some good hours of reading. The free ebook is all we need now. Free only works if it doesn't completely solve your problem. In the year 2000, you couldn't really read ebooks online, it was hugely impractical. By providing it for free he created a demand for the real solution, which at the time was a real printed book. Note: It is interesting that Seth didn't actually plan this. The printed book was a reaction to people's demands. It was not a preconceived plan. The Ideavirus' success was also due to a number of other factors. The internet was booming. Everyone was talking about it, but nobody knew why. What Seth Godin did was to explained it in very simple terms. He also bridged the gap between real people and the technical internet. Unlike most other books at the time, his book wasn't about the technical internet. It was about the people. The very thing take makes it all work. The reason why it all happens. It was the right book, for the right people, and at the right time. And, by publishing the book for free online, he reached the most passionate and highly engaged people of all times - the early adopters. How do you do this today? If you want to repeat his success today, you have to the same, but updated to modern times. You need to write it so that it removes obstacles. You didn't need to understand the internet to read Seth's book. Give them your book for free, but in a format that only "kind-of works." - using the new platform and channels. You need to provide a real paid-for ebook for the mainstream. Here is an idea. Why not make the book available on Facebook? Seth Godin has also moved on since the Ideavirus days. He promoted his latest book, Poke the Box, by giving people a discount based on how many subscribers he got for his free newsletter. That's what I'd like to try. The final pre-order price for the Kindle edition of Poke the Box will be determined by how many of you sign up to get our free online newsletter. We already have about 10,000 subscribers, so we've already lowered the price. (We started with a pre-order price of $9.99 - we're down $2). Amazon has agreed to work with me in lowering the price one more dollar for every 5,000 new people who sign up. So we're starting at $7.99. Note: The Poke the Box ended up costing just $1.15. While this obviously wouldn't work in the long run, it is a great way to build up momentum for the books to come.